You Doll You! Gift Certificates make excellent gifts for friends, family, and co-workers. Gift Certificates are available in any dollar amount or for any service. Each You Doll You! Gift Certificate is handsomely printed on heavy card stock and comes with a lovely red envelope. 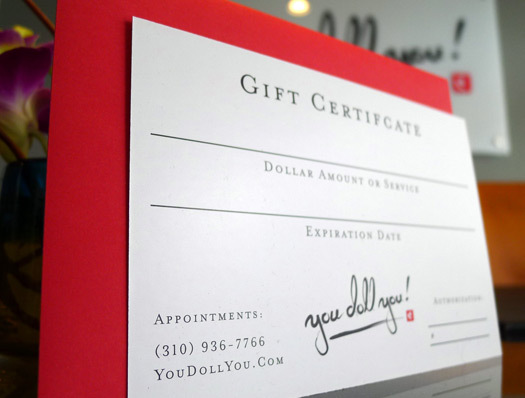 This type of gift certificate may only be purchased in person at the You Doll You Eyelash Extension salon in Beverly Hills. If you would like to instantly send an electronic gift certificate to anyone, anywhere at any time, please click here!